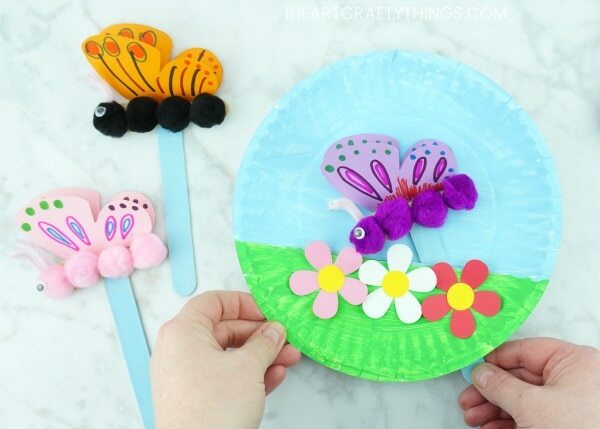 Kids will not only love the creative process of making this paper plate fluttering butterfly craft but afterwards they will have a blast getting to play with it. All they have to do is move the craft stick around on the back of the paper plate and watch as their butterfly flutters around the sky and above the colorful flower garden. 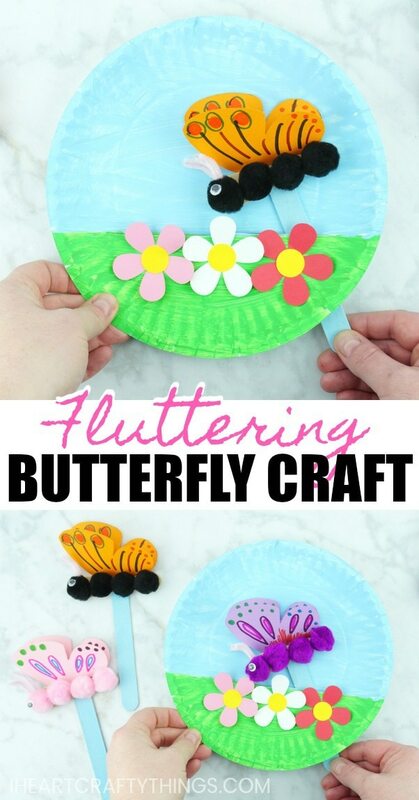 This creative butterfly craft is perfect for a colorful spring craft or summer craft and makes a great compliment to learning about and observing butterflies around your home or neighborhood. 1. Begin by painting your jumbo craft stick with blue paint. Then paint the bottom third of your paper plate with green paint and the top section with blue paint. Set both pieces aside to dry completely. 2. Heat up your hot glue gun. Add a line of hot glue along your wooden scoop stick. 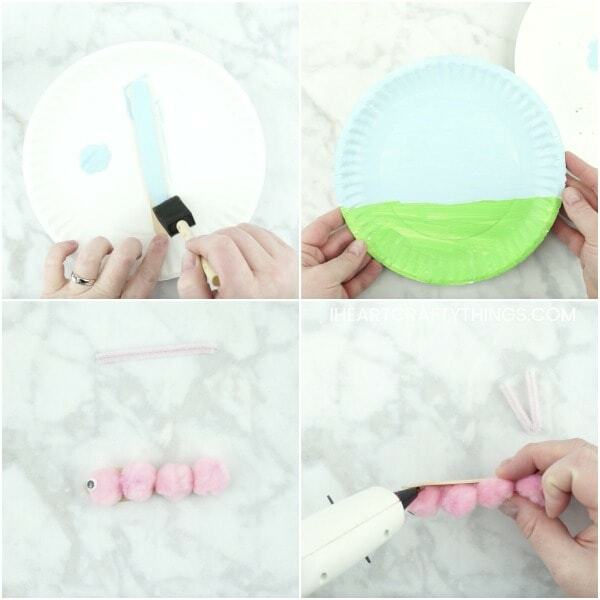 Glue fuzzy poms along the scoop stick. Then glue a small googly eye onto the first pom. 3. Cut off a small section of pipe cleaner. Bend it in half to make antennae. Add a dot of hot glue behind the first pom and glue the antenne onto your fluttering butterfly. 4. Cut butterfly wings out of your colored cardstock. You can also get a copy of our butterfly wings template when you sign up for our weekly newsletter at the bottom of this post. 5. 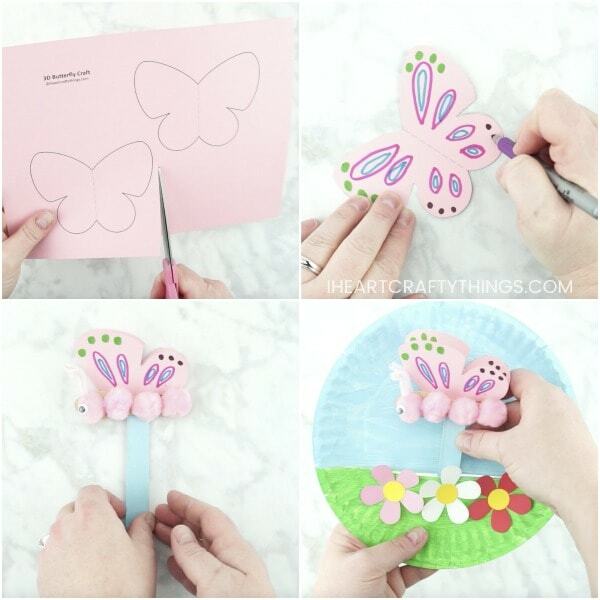 Use markers to decorate the butterfly wings. Then fold the wings in half and decorate the outside section of the wings. 6. Glue the butterfly body near the top of the jumbo craft stick, followed by the folded butterfly wings at the top of the butterfly body. 7. 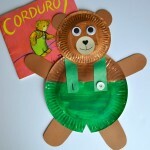 Have an adult use a craft knife to cut a slit on the inside of the paper plate at the top of the green grass. 8. Use your flower paper punch to create several paper flowers (or cut out your own flowers). Glue them at the top of the green grass. 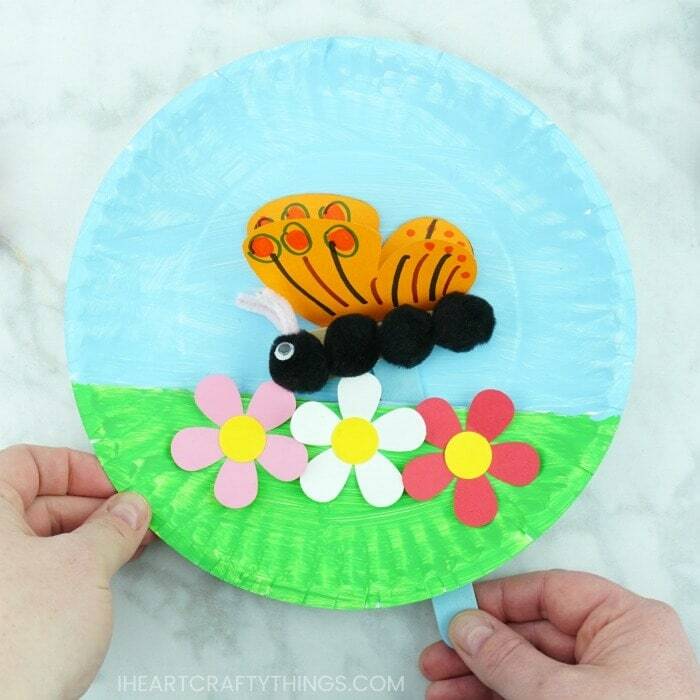 Your paper plate fluttering butterfly craft is finished! 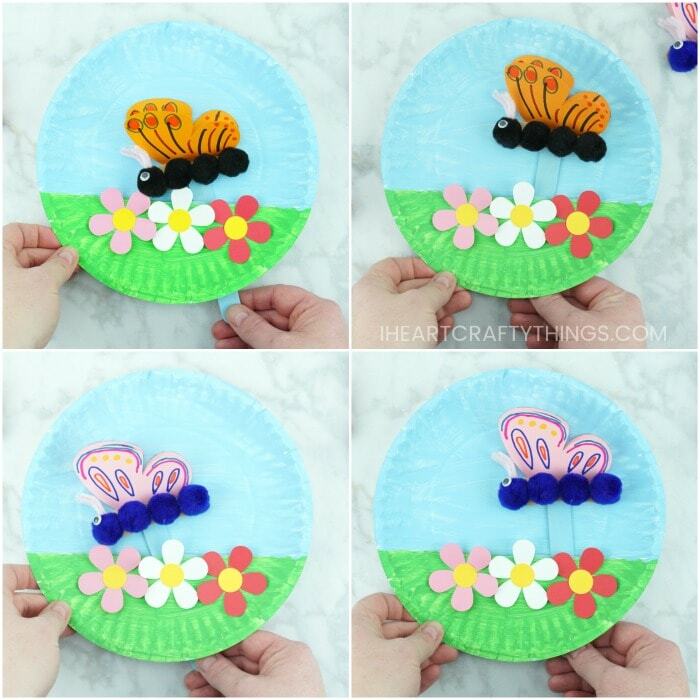 To play with your butterfly craft, place the blue jumbo craft stick down into the slit on your paper plate. Hold the stick behind the plate with one hand while holding the paper plate steady with your other hand. Move the craft stick around and watch as your butterfly flutters in the sky above your flowers. 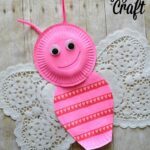 Looking for more fun interactive paper plate crafts? This swimming jellyfish craft is simple to make and is sure to create giggles while playing with it. Here’s a fun way to create a spider web out of a paper plate and then watch as your spider moves up and down it’s web. Turn your paper plate into an ocean scene and have fun sailing around your boat along the ocean waves! 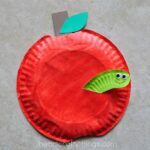 I wold like more ideas on crafts for kindergarten. .. I’m planning to open home based one. ..